PRESQUE ISLE, Maine — Although the 24th annual Relay for Life, a fundraiser for the American Cancer Society, will not happen until late June, spreading cancer awareness and raising funds has been looming large in Lisa Leduc’s mind ever since last year’s event ended. Leduc, professor of criminal justice at the University of Maine at Presque Isle, knows all too well the emotional and physical toll that cancer has on patients and family members. In 2004 — two years after she and her family had moved to Presque Isle from Canada for her position at UMPI — she was diagnosed with breast cancer. She was 39 years old and remembers feeling in denial after hearing the doctor’s news. 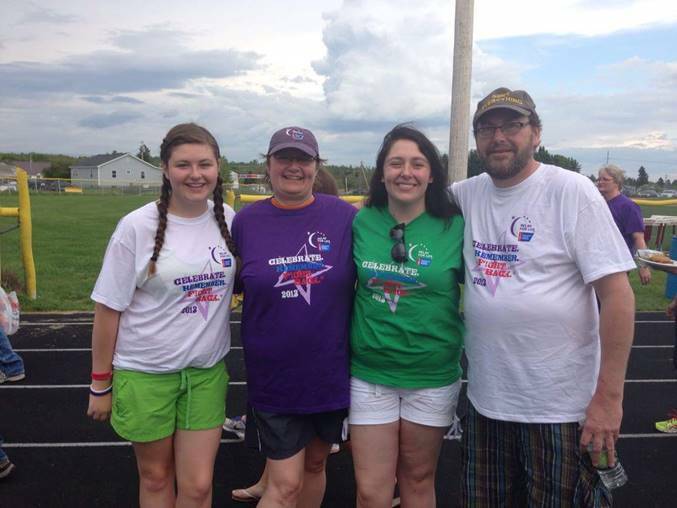 UMPI Professor of Criminal Justice Lisa Leduc (second from left) poses with her daughters Sedona (left) and Jesse Lewis and her husband Kevin Lucas during the 2012 Relay For Life event in Caribou. Leduc has been a member of UMPI’s Relay team since 2005 after battling breast cancer. After seven months of chemotherapy and radiation treatments Leduc was declared cancer free and she hasn’t had to deal with the disease as a patient since. But nearly a decade later, in 2013, she lost her mother to esophageal cancer and then her father to leukemia in 2015. Though being a cancer patient is difficult, Leduc said she would do it all again if it meant not seeing both her parents — Carol and Gerry Leduc — endure the disease. While Leduc’s mother passed away four months after her diagnosis, her father passed away only two days after learning he had leukemia due to the disease going undiagnosed for an entire summer. Exactly one year after Leduc’s cancer diagnosis — on June 4, 2005 — she participated in her first Relay for Life event, which at the time was held at UMPI. 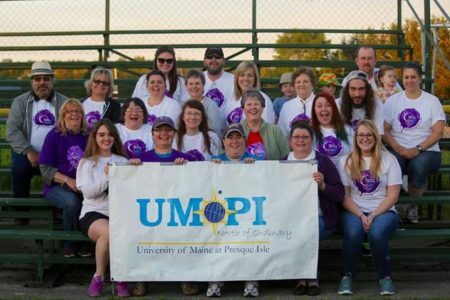 Since then she and Laurie Boucher, UMPI assistant director of financial aid, have built a Relay for Life team that includes 30 UMPI staff and faculty members, their family members and friends. Relay for Life raises funds for the American Cancer Society that are mainly used for research that aims to develop new and improved cancer treatments, all in the effort of finding a cure. 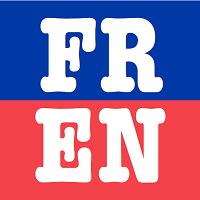 This year’s event will be held on Saturday, June 22, at Caribou High School from 11 a.m. to 11 p.m. and include 17 teams from Aroostook businesses, organizations, churches and families. Lisa Leduc, UMPI professor of criminal justice, (front row, second from left) has been part of UMPI’s Relay For Life team since 2005. She has used her story of surviving breast cancer as well as her parents’ tragic deaths from the disease as a way to spread awareness and raise funds for cancer research and recovery. Leduc and Boucher have been co-captains for their team, UMPI Owls: We Give a Hoot, since 2009. They have nearly reached their goal of raising $100,000 in 10 years, with a total of $97,000 thus far. The team begins fundraising every July after Relay for Life and doesn’t stop until the event in late June. As of March 29, they have raised $4,784 through fundraisers and individual donations since July 2018. Recently the team found out that no college or university in New England has ever raised $100,000 from a single, sustained effort, meaning that they’ve consistently raised money as an official Relay For Life team for many years. Throughout the year, UMPI’s Relay for Life team hosts many popular fundraisers, including a garage sale, a silent auction, stew night, a Fit Night at Gentile Hall and the Think Pink basketball game on campus. On Saturday, April 20, team members will participate in the Relay for Life Chocolate Festival at Caribou Middle School from 10 a.m. to 2 p.m., which raises funds for all Relay teams. Last year the festival raised $5,000. Boucher became involved with Relay For Life after her mother, Damey Boucher, was diagnosed with stage 4 throat cancer in 2004. Although doctors initially said that she would likely live three months, she persevered for six years and became a regular supporter of and participant in Relay For Life. Damey Boucher passed away in May 2010. She had been cancer free since the previous December until doctors found tumors that had spread to her lungs. Today, Boucher remembers her mother as someone who had a fighting spirit and a willingness to take on experimental cancer treatments in Boston if that meant she could help future patients. She said that throughout all of life’s challenges her mother fought to live and witness the most important moments. “She saw her son get married and her granddaughter be born,” Boucher said. Both Leduc and Boucher said that they relied on phone calls and the website of the American Cancer Society for information and comfort during the most emotional times of their parents’ ordeals. For Leduc, giving back means moving toward a future where her daughters Sedona, 21, and Jesse Lewis, 25, have access to technologically advanced cancer screenings and prevention methods. 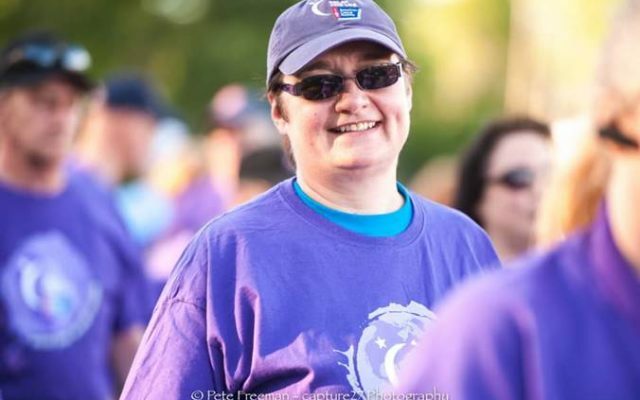 Boucher said that although most of the Relay For Life funds go toward the American Cancer Society as opposed to remaining in Aroostook County, the fundraiser’s mission remains a crucial one. “It’s about making sure people never have to go through what our families went through,” Boucher said.